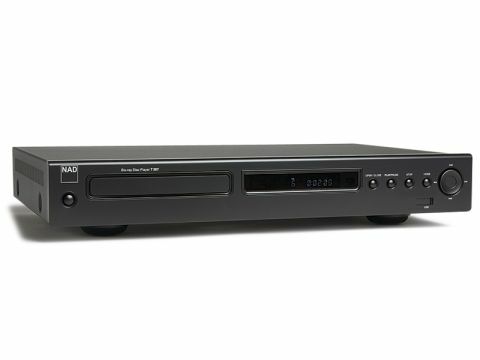 The T587 marks NAD's first foray into Blu-ray, jumping straight in with a fully-fledged Profile 2.0 machine. And with a price tag almost three times as much as your average budget deck, this is not for the cash-strapped, so let's hope the specs and performance justify it. The T587 is certainly well built, and looks more grown-up than most budget players, with just an understated, dark grey finish, a neat row of buttons and a nicely sized display window. In fact, it looks more like a CD spinner than a Blu-ray deck, a result no doubt of NAD's hi-fi heritage. The Profile 2.0 spec enables you to share in the delights of BD Live, a feature made possible by the Ethernet port on the rear. Surprisingly there are no multichannel analogue outputs, which is disappointing for such an expensive and audio-oriented deck. The T587 can, however, decode Dolby True HD and DTS HD Master Audio and output them as PCM from the HDMI output, or output the encoded bitstream instead. It also pipes Dolby Digital Plus from the optical or electrical digital outputs, as well as the HDMI. On the front of the unit is a USB port, covered by a sliding panel to keep the dust out. With no built-in memory, you'll need to plug in a USB flash drive to store BD Live downloads, but you can play MP3, WMA, DiVX and JPEG from a USB stick, too. Firing up the player, we were greeted by a surprise – its front-end operating system is the same as LG's BD300. Technology sharing isn't uncommon among Blu-ray players and in this case it's a shrewd move, as the LG's vivid colours and sharp, jazzy graphic interface make it a joy to use. Another benefit of borrowing from LG is that the T587 inherits the fast loading times of the Korean company's players. Spider-Man 3's first moving video took 35 seconds to appear after closing the disc tray, while Transformers' first menu appeared after 27 seconds. The deck also skips to chapters quickly and begins searching as soon as you press the button, an area where some rival Blu-ray decks fall short. Not only that, but the remote also makes navigation a breeze. The shape is large, yet ergonomic, and it's finished in a coffee table-friendly gloss black. The buttons are nicely spaced out, with a conveniently placed ring of menu controls, plus labelling is clear. If we're being picky, we'd probably have put the playback buttons higher up, but otherwise it's a top-notch zapper. The T587 isn't simply an LG deck in a different box – NAD has stamped its own personality on the internal electronics, but with limited success. As per LG's players, its pictures are generally watchable, but not up to the same standards as rival machines from the likes of Panasonic or Pioneer. The main drawback is detail reproduction. Although the NAD's images have an undeniable high-definition air about them, they don't reach the same level of jaw-dropping sharpness and precision that you get from the DMP-BD80, for example. Shots of the deserted New York streets at the start of I Am Legend are simply mesmerising on Panasonic's player – here they look pedestrian, with a detectable softness that lessens their impact. The same can be said about edge clarity and black depth, which are also fine, but don't knock us for six. And to aggravate matters, the pictures are beset by a dusting of noise that oscillates gently within billboards and other areas of background scenery. Let's not forget the good stuff, though, such as the T587's superb colour reproduction. Skin tones are beautifully nuanced and strong colours boast real potency. Motion handling is also slick, as demonstrated when Will Smith's car is tracked with nary a trace of judder as he races around in pursuit of the deer. Sadly, a run-through of the Silicon Optix HQV Blu-ray test disc plunges us back into the negative – both the Film and Video Resolution patterns contain strobing boxes, which indicates half-resolution processing; rotating bars exhibit significant jaggies, and there's noticeable flickering in the upper seats during the pan across the Raymond James stadium. DVD pictures are also disappointing. Upscaled to 1080p, The Two Towers appears softer than we expected, while its performance with the HQV DVD is peppered with flaws – detail is soft, the rotating bar shudders violently on the jaggies test, and it fails to detect the cadence correctly on the 2:2 Telecine B clip. The NAD's sound performance is much better. Dolby True HD, DTS HD Master Audio and decoded LPCM are bursting with detail and there's plenty of bottom-end burliness. From the analogue stereo output, the T587 injects any CD it plays with a healthy dose of energy and detail and delivers a good balance across the frequency range. You can pick up the T587 for around £700 online, but that's still too expensive for a player with such lacklustre picture quality. There are rival players that deliver better picture performance and more features at under half the price. Its attractive operating system, fast disc loading times and smooth sound may win it some fans, but it needs more than that to earn our wholehearted recommendation.